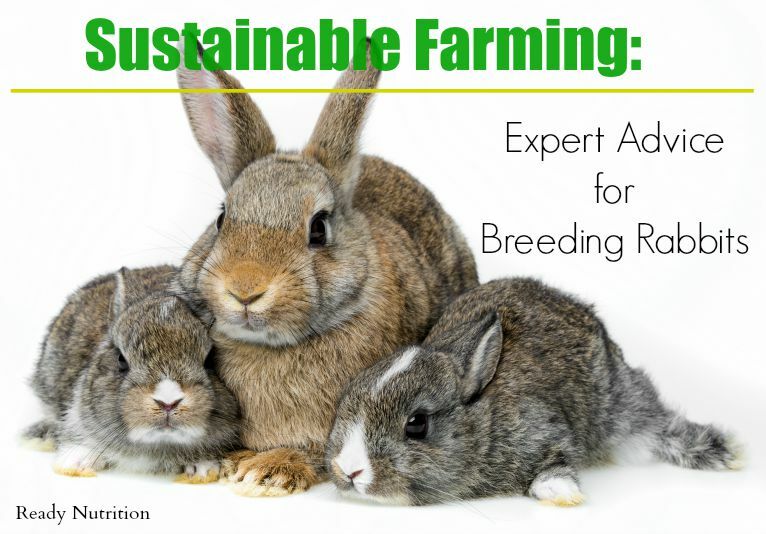 Breeding rabbits isn’t rocket science, but does require special care during this time. This segment of our sustainable farming series details tried and true methods of breeding your doe and how to ensure the kits are delivered healthy. In the previous post, we talked about how to select the correct breed for your production goals and the type of housing and feed needed prior to acquiring the rabbits. In this segment, we’ll discuss breeding your rabbits and the care required of your breeding trio from gestation through birth. Once you’ve selected your breed, it’s time to focus on getting them to the optimal age and condition for successful litters. Regardless of your production goals (meat, pelt, or fiber), certain criteria needs to be met in order to insure the best outcome for your efforts. At this point, you’ve already chosen the housing option that best suits your needs (wire cages or colony-style), the location for the housing that provides the correct amount of shade, predator protection, and protection from the elements, and feed that provides a balanced diet. Larger breed does should be between six to eight months of age before breeding. This gives them time to reach a mature size and weight that will stand up to the rigors pregnancy, birth, and the demands of nursing. Rabbits can and will breed as young as twelve weeks old, so care should be taken to keep your buck and does separated. Does that are bred too young will never reach their optimal size, are at higher risk of dying during birth, and will produce smaller litters of unthrifty kits. If possible, weigh your does and buck prior to breeding. This information, along with other factors we’ll discuss later in the article, will give you a baseline for tracking the health and production of your rabbits. Record keeping is important because it allows you to determine potential health issues before they become a problem and to know which of your rabbits produces well or should be culled. Production information over time will also help you in determining which kits you should keep as replacement breeders when it comes time to cull unproductive does who are no longer producing at optimal levels. Check the overall health of each rabbit- a healthy, age-appropriate breeding rabbit should have clear, alert eyes, be free of any nasal discharge, be within the optimal weight range for their breed, and have a sound structure free of any defects or injuries. This is a good time to perform the regular maintenance on your breeders: check their hocks for sores, their reproductive organs for any injury or infection, trim their toenails if needed (human nail clippers work well for this task), check their teeth to make sure they have correct formation and, aren’t broken, malformed or diseased, and look in each ear to make sure they are clean and debris and mite free. Now that you’ve ensured you have healthy rabbits, it’s time to get the party started! Choose a cool time of day so your rabbits won’t become over-heated. Unlike most other animals, rabbits don’t “come into heat” and are instead on-demand ovulators. This is also known as induced ovulators. 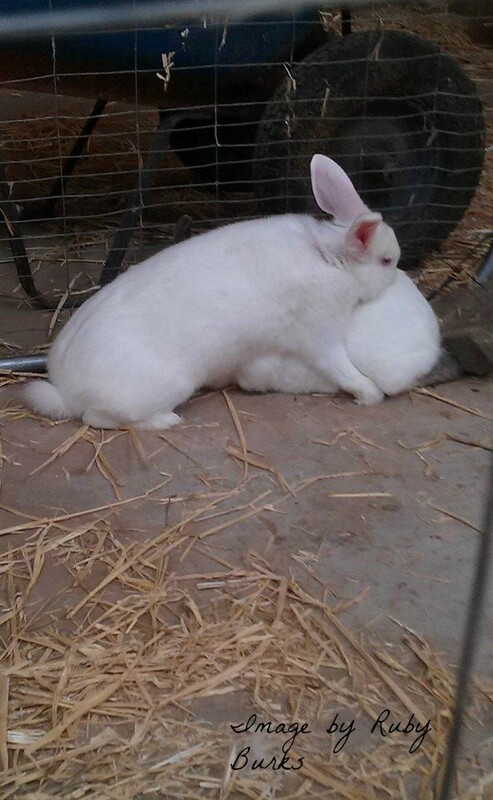 This means the female rabbit only releases eggs once she’s been mounted by the male. If you’re raising rabbits in a cage, always take your doe to the bucks’ cage and never the other way around. Does are extremely territorial and have been known to kill or castrate a buck to protect their territory. Another option is to provide them with a neutral cage where neither the doe nor the buck lives. If you choose to go this route, place the buck in first and then the doe. If you’ve decided to go with colony-style housing, it’s a simple matter of placing the buck in the colony and watching carefully for aggression on the part of the does. Be sure your colony has ample room for the buck to run away from the does. It also helps to provide obstacles like logs, buckets, or anything for the buck to hide behind if one of the does become too aggressive. Either way, never leave a just introduced buck with a doe unattended. Although some breeders do this, it increases the risk of injury and death for your rabbits and makes it impossible to know if they have bred successfully. Every buck is different- some will try to go straight to business and some will woo the doe by slowly hopping after her, nuzzling, and grooming her. Don’t be surprised if your virgin doe seems frightened of this whole ordeal. Give her time to calm down. If the doe is receptive, the buck will mount her, she’ll lift her hindquarters slightly, and within a minute or two, it will all be over. Rabbits are quick! You’ll know the buck ejaculated when he looks like he just had a seizure, makes a funny noise, and falls over sideways. We allow our bucks to mate twice before separating the buck and the doe. If your buck needs to service more than one doe, give him several hours rest between each doe so he can regain his energy and to ensure the highest number of viable sperm. One doe in the morning and the other in the evening works well. If you have more than two does, allow your buck a full day of rest before using him again. For obvious reasons, does can get a little frustrated by bucks like this, but give them time without interrupting them and they’ll figure it out. If you’ve done everything suggested above, and despite your best efforts, your buck or doe just will not breed, it’s time to consider something else might be going on. Rabbits are bottom of the food chain prey animals and can frighten easily. Are you providing a safe, quiet environment where they can feel secure enough to let their guard down? Is your doe too old? Optimally, does should be bred before they’re one year of age. Beyond that and their pelvic bones may start to harden and lose their elasticity. Is either your doe or your buck too fat or too thin? Animals in poor condition have a difficult time reproducing. If you haven’t already weighed your rabbits to ensure they’re within the acceptable weight range for their breed, now is a good time to do it. If you don’t have access to a scale, try to manipulate their abdomen and see if you can feel any fat pockets. Is your doe already bred? Rabbits can breed so young and so quickly, it’s easy to miss the action. Did your doe and buck have access to each other, even for a few minutes, within the last 30 days? If possible, try your buck with a different doe and your doe with a different buck to try to figure out which one is the problem. If your doe refuses more than one buck after multiple rendezvous, it’s possible she’s your issue. The reverse is true for your buck. Congratulations! Don’t forget to write down the name of the buck and the date of the successful breeding in your Doe Breeding Chart. In twenty-eight to thirty-one days, if everything goes well, your doe will kindle. Calculate out twenty-five days from the bred date and record it as the nest box date. If you’re raising your rabbits in cages, it’s important that you don’t provide the nest box too soon. Some does will soil the nest box by deciding it is the best place to poop and then will choose to have their kits on the wire. This almost always means death for the kits. However, placing the nest box too late doesn’t give the doe time to build her nest and occasionally, does will kindle early. An early doe with no nest box has no choice but to kindle on the wire. On the twenty-fifth day, place the nest box in her cage and provide her with nest building material: straw, dried grass, dried rabbit-safe leaves, etc. About twenty-four hours before she gives birth, she’ll start supplementing the bedding by pulling fur from beneath her chin and her belly. This not only provides a warm, soft nest for the kits but also helps her expose her teats for easy nursing. Keep a close eye on a doe starting around the twenty-eighth day. Once her kits are born, give her a couple of hours minimum to clean herself up, recover from the hard work of birth, and tend to her kits before disturbing her. Once she’s calmed down and seems to be relaxing, very slowly and calmly examine the kits. Remove any afterbirth she couldn’t take care of, dead kits, and any soiled or bloody nesting material. If possible, try not to remove the kits from the nest box while doing the health check. They chill easily and it upsets the doe. Record your findings in your Doe Breeding Chart (see link above). For the next week, check the kits daily. Nest box losses usually occur within the first 48 hours; however, kits that are well-latched onto a teat can sometimes be accidentally dragged out of the nest box by the doe. She will not put them back in and they will die very quickly from exposure. If you find a kit outside the nest box, simply pop them back in. Next, we’ll go over how to care for your rabbits and what to expect from birth to butcher. This is wrong, never put your buck in the doe cage. Thank you. I know nothing about raising rabbits and even I thought that was a mistake. I had to re-read it several times to make sure I was reading it right. You are correct, Cindy- good catch. I didn’t realize I had transposed that. It’s always nice to have another set of eyes. I’ll correct that shortly. Thanks!